Tonight, it is estimated that more than 1 billion people around the world will watch the illuminated ball drop in Times Square to ring in the new year. This New Year’s tradition in Times Square dates back to 1907—the dropping ball replaced an earlier fireworks display—but the notion of dropping a ball as a way of keeping time is a much older tradition. 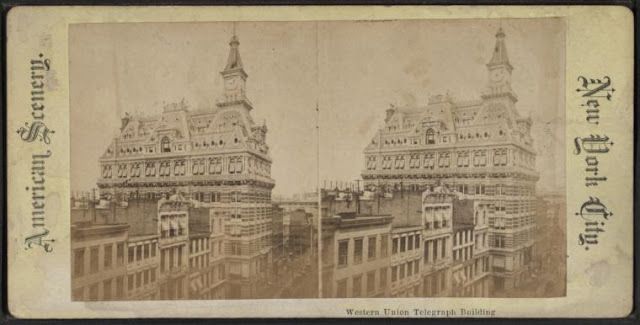 In 1877, a ball was added to the top of the Western Union Building on Lower Broadway. (We couldn't find a postcard of this building in our collection; the above stereo slide from the Library of Congress will have to do.) Each day at noon, a telegraph signal from Western Union’s main office in Washington, DC, would trip a switch in New York and the ball would descend from the flagpole. Visible throughout the Financial District—and, more importantly, from all the ships in the harbor—it allowed people to reset their watches and ship chronometers. For the first time, New York ran on a standard time. As the New York Times noted in 1877, this idea of a ball dropping to keep the time wasn’t new. 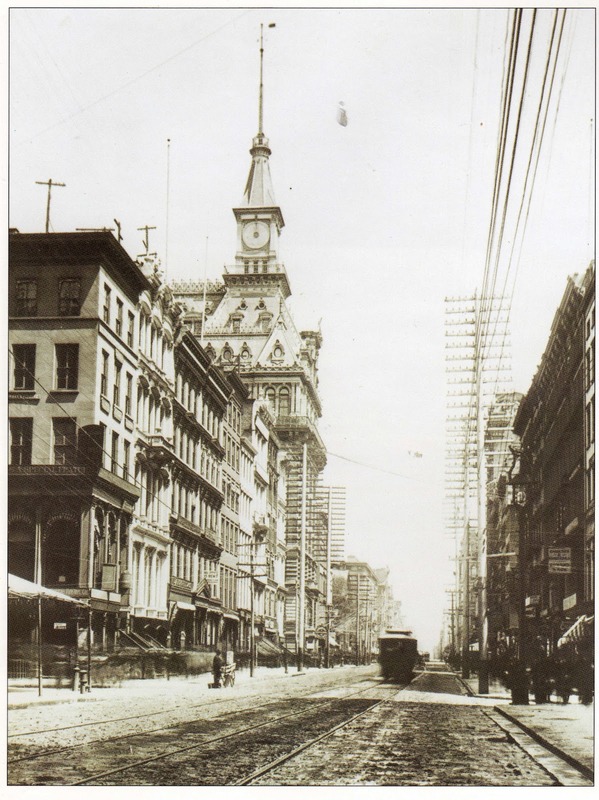 For many years prior to the Civil War, the New York custom house had signaled the time with a ball drop, and in the 1870s it was common to find time balls in major European ports. 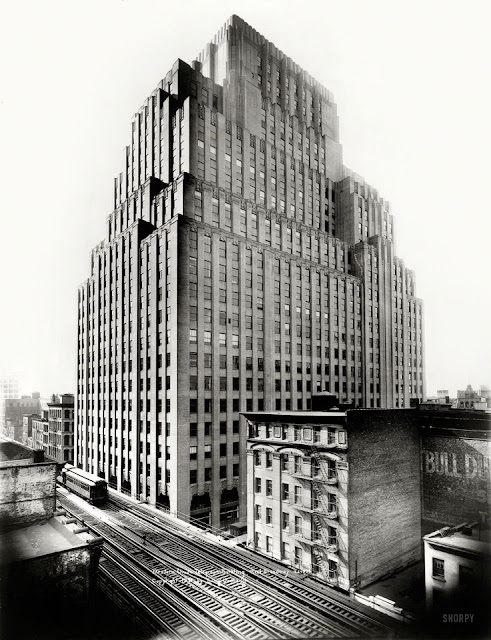 However, when it began operation in April 1877, the Western Union ball was the only one in a North American port and quickly became a fixture of the Manhattan skyline. Telegraph wires run on Broadway outside the Western Union Building. After the Blizzard of 1888, these would all be buried underground. Western Union, afraid that the time ball wasn’t always going to work, set up a system whereby a red flag would be flown from 12:01 to 12:10 p.m. on days that the ball refused to drop. Further, information would be sent to the press each day informing them whether the ball actually dropped at noon or had fallen at the wrong time! 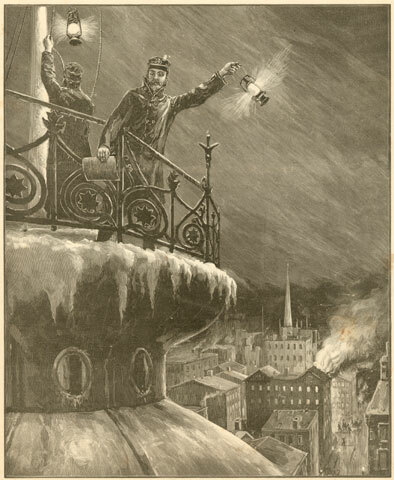 When the Times ushered in New Year's from their brand-new skyscraper in Times Square in 1904, they did so with fireworks shot from the building's rooftop. However, the police soon began to fear that fireworks might be a hazard in the rapidly developing neighborhood. Instead, in 1907, the Times adopted the time ball as their symbol for ushering in the new year and placed a giant ball atop their skyscraper. That original Times Square ball, made of iron and wood and lit by 25 incandescent lights, weighed 700 pounds. We've been dropping a ball from the top of that building ever since. The current time ball, lit by energy-efficient LED diodes, now stays atop the old Times Building year round so that everyone who visits New York can see the actual ball that drops on New Year’s Eve. Those immortal words, first published anonymously in the Troy Sentinel in 1823, have become a central part of the American Christmas story. 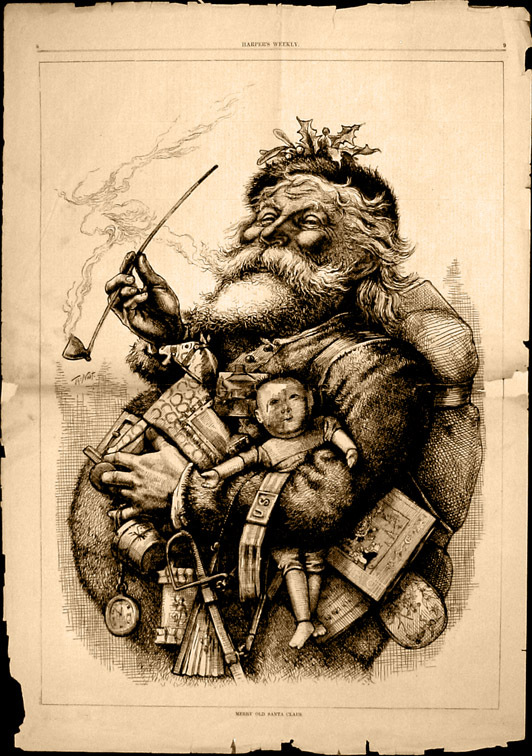 They were penned by Clement Clarke Moore, a prominent New Yorker, and together with Thomas Nast's depictions of Santa later in the century (such as the 1881 version above) helped shaped our modern ideas of Santa Claus. 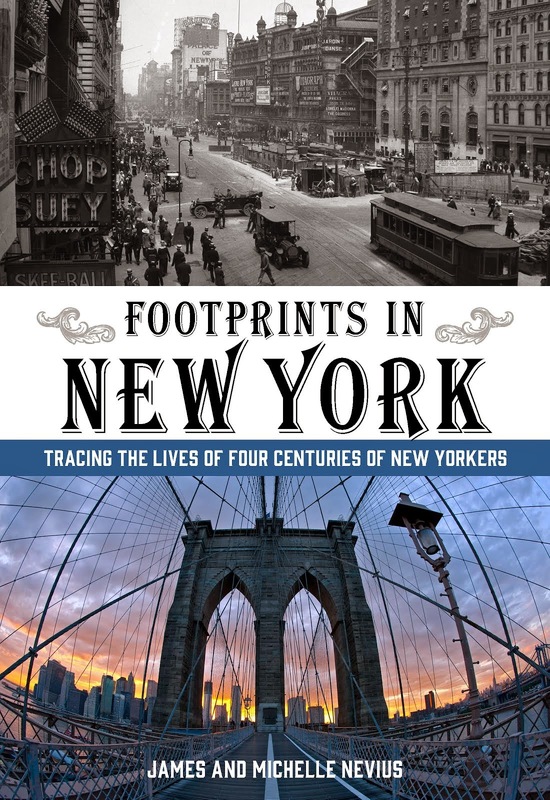 We write about both men in Footprints in New York and Inside the Apple, though in neither case about their contributions to Christmas. To his contemporaries, Moore was best known as a Greek language scholar at the Episcopal Church’s General Seminary, and for his vast farm, Chelsea, which gave rise to the neighborhood of the same name. Today, people recognize him as the author of “A Visit from Saint Nicholas” (aka “Twas the Night Before Christmas”), the well-known poem that imbued the American Santa Claus with a healthy dose of his mother’s family’s Dutch traditions. Moore is also the person responsible for building the Church of St. Luke in the Fields in Greenwich Village. Even for someone of Moore’s social station and wealth, commuting from Chelsea to [go to church all the way down in] the city was difficult. The best route was via the Hudson River by sloop, but this wasn’t always possible or practical. 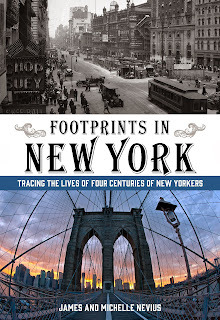 Overland, there were two options: the longer route via the Albany Post Road on the east side of the island, which connected to the Bowery and then to Lower Broadway or the shorter “Road to Greenwich,” which ran up the Hudson side of the island to the vicinity of 14th Street. However, this road (today called Greenwich Street), was so close to the river—and had to go through at least one swamp—that it was rutted, muddy, and frequently impassable. Moore’s solution to this quandary was to ally with residents of the nearby village of Greenwich and convince Trinity Church to sell off part of the northern section of their land so that an independent Episcopal church could be established. The cornerstone for the church was laid in 1821 at a site on the corner of Hudson and Burrows [now Grove] Streets. The name of St. Luke, the healing evangelist, was chosen to reflect Greenwich’s role as a place of refuge for New Yorkers during summer outbreaks of yellow fever and other pestilence. 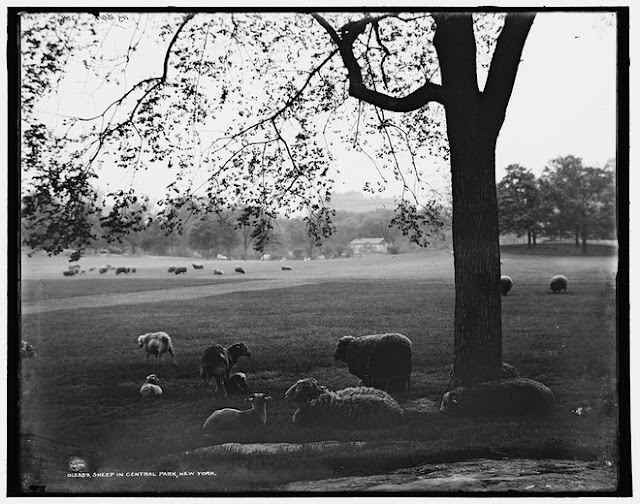 Due to its rural location, the parish was soon dubbed St. Luke in the Fields and it became the center of religious life for the residents of Greenwich, Chelsea, and other outlying areas. Thomas Nast, meanwhile, is probably best remembered today for his role in bringing down William "Boss" Tweed through his political cartoons in The New York Times and Harper's Weekly. Nast's poison pen was so famous, in fact, that there's a folk etymology that the word "nasty" comes from his name. That's not true, but it gives a sense of how damning his pictures could be. Nast is also the person who gave us the elephant as the symbol of the Republican Party and the donkey for the Democrats. In an 1870 issue of Harper's Weekly, Nast launched the donkey as a symbol of the Democratic party. In the cartoon, Nast was lambasting the Copperhead faction of the party -- which had opposed the Civil War -- and those Democratic papers that continued to criticize Lincoln's recently deceased Secretary of War, Edwin M. Stanton. Nast's critique is not terribly subtle: Stanton is "lionized" by the cartoonist and the Democrats are branded jackasses. But despite Nast's pointed political statements, he had a soft spot for the holidays. 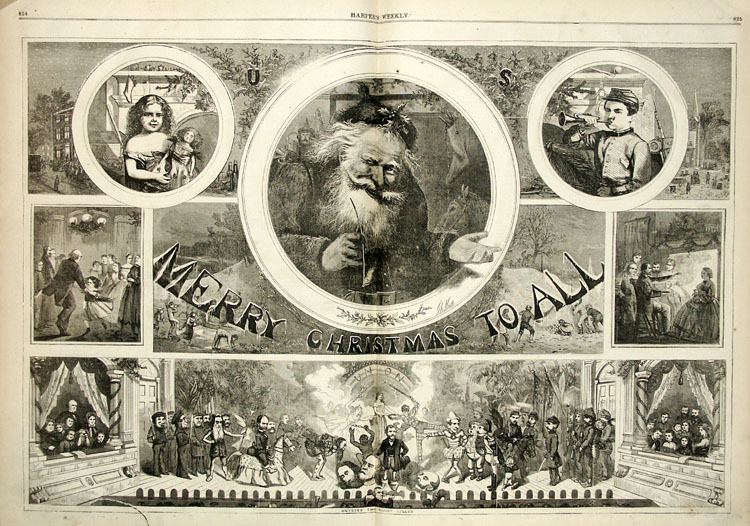 Beginning in 1863, he would draw pictures of Santa Claus or families celebrating together for Harper's, culminating in 1881 with the image at the top of this post, which is still seen by many as the iconic depiction of St. Nick. The image in today's postcard (which is actually a commemorative print) depicts an event that took place over three days, December 16-18, 1835. So, technically, Postcard Thursday isn't one day late. 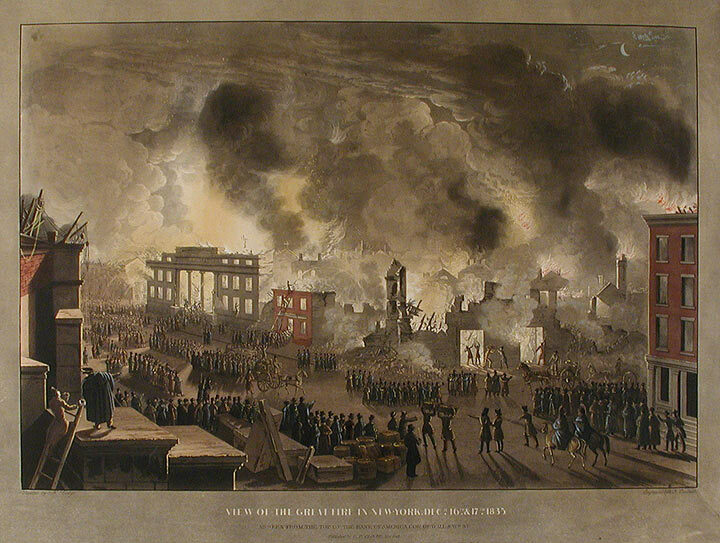 This year marks the 180th anniversary of the Great Fire of 1835, the most devastating fire in the Western Hemisphere since London's near-total destruction in 1666. On the night of December 16, 1835, a gas line broke in a dry goods store near Hanover Square in the Financial District; the gas, ignited by a coal stove, caused the store to explode and the ensuing fire quickly fanned southward along Stone Street and northeast toward Wall Street. 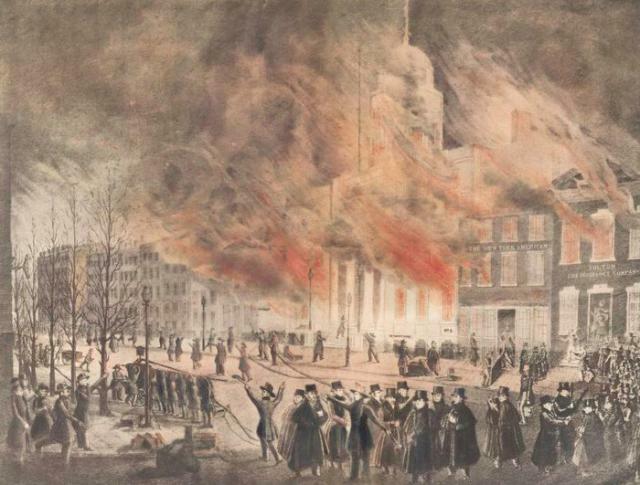 Not only was it the worst fire in New York’s history, it wiped away almost all of the remaining traces of the old Dutch and British colonial city. 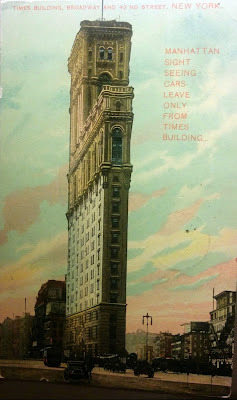 New York had some of the nation’s strictest fire codes; buildings were never erected with common walls, and brick and stone were favored over cheaper wood (though this was as much about status as safety). Every home was required to have a leather fire bucket affixed to a hook by the door and every business had to have at least two. At the sound of the first alarm, the city’s volunteer fire companies turned out in force. As per instructions, every fire bucket was made ready, and bucket brigades formed to nearby wells and cisterns. Unfortunately, it had been so cold for so many nights that the wells were frozen solid. When the firefighters changed tack and headed for the East River instead, they found to their chagrin that the river was frozen, too. With no other source of running water, they were forced to improvise. At the ends of the piers, holes were hacked in the ice and fire engines lowered down to pump water. However, by the time they were able to get any water flowing, the hoses had frozen, and when they did manage to get water up, most of it was blown back as frozen ice into the faces of the firemen. In some places, the only way to stop the fire’s spread was to blow up buildings in its path to create a makeshift firebreak. In the end, the fire had to burn itself out and, in the process, it destroyed much of the area between Broadway and Pearl Street in the financial district. If you happen to be down in that neighborhood, take a walk down the block of Stone Street that connects Hanover Square to Coenties Slip. This is the area known today for its string of restaurants and pubs; the buildings themselves, however, form a sort of memorial to the fire. Almost all of them were built within a 12-month period in 1836-37 to replace countinghouses and warehouses destroyed in the Great Fire. Notice how many of the buildings have extra wide doors (to haul in cargo) and strong, granite curbs to keep goods from accidentally plunging in to the basement. a valiant attempt was made to rescue a 15-foot statue of Alexander Hamilton from the floor of the exchange, but just as the statue reached the doorway the roof collapsed, destroying it. The statue, by Robert Ball Hughes, was the first marble statue created in the United States and had only been installed eight months earlier. 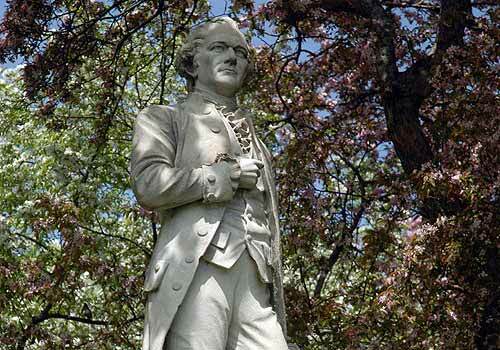 Though it took 45 years, the statue was ultimately replaced by Hamilton’s youngest son, John C. Hamilton, and it stands in Central Park behind the Metropolitan Museum of Art. This statue in the park is remarkable in that it is made entirely of granite—not the easiest stone to carve—and it has long been thought that John C. Hamilton commissioned the work out of this durable stone so that no matter what calamities might befall Central Park, his father’s statue would endure. Many readers of this blog and of Inside the Apple and Footprints in New York will know that Central Park's Tavern on the Green was originally a sheepfold. 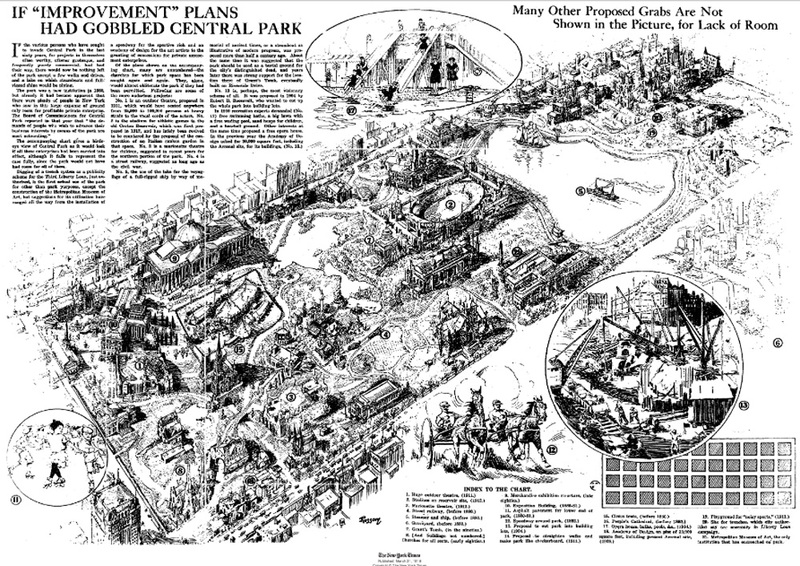 But what many people don't know is that it wasn't supposed to be in the park at all -- it was an addition made during the era that William "Boss" Tweed ran the park. James has a story on Curbed that details many of the "mutilations, intrusions and perversions" that have been proposed over the years for the park. Most have never made it off the drawing board, but some -- like Tavern -- are now integral parts of the park. Sunday, December 13, at Noon.